In April GCC received its first significant financial commitment from Cuyahoga County Prosecutor Michael O'Malley to fund professional consultants to begin the planning stages for creating two new Mental Health Crisis Centers in Cleveland. In other cities, these centers have proven highly effective at diverting large numbers of citizens suffering from mental health and addiction away from the criminal justice system and into treatment and support, as well as saving municipalities millions of tax dollars. Remembering IAF Director Ed Chambers: Gathering in Chicago in early June, IAF current and former organizers, board members, leaders, and friends held a memorial service for Edward Chambers, long-time director of the Industrial Areas Foundation (IAF) who died on April 26, 2015. 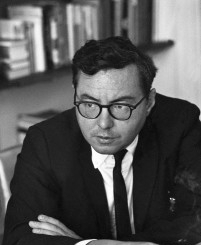 Chambers succeeded IAF’s founder Saul Alinsky as executive director and built the modern IAF. Read Reflections on Chambers’ legacy in the New York Times, The New Yorker, Chronicle on Philanthropy as well by long-time colleague and current IAF Co-Director Mike Gecan. GCC WORKS WITH US DEPARTMENT OF JUSTICE TO HOLD CLEVELAND POLICE ACCOUNTABLE: Following an investigation by the US Department of Justice (DOJ), which found major foundational flaws in the Cleveland Department of Police, Greater Cleveland Congregations (GCC) worked to shape the consent decree, a legally binding agreement to incorporate changes into the city’s police department. In January, GCC held teach-ins to educate its leaders on the findings of the DOJ investigation, and then researched best practices found in other cities’ consent decrees. 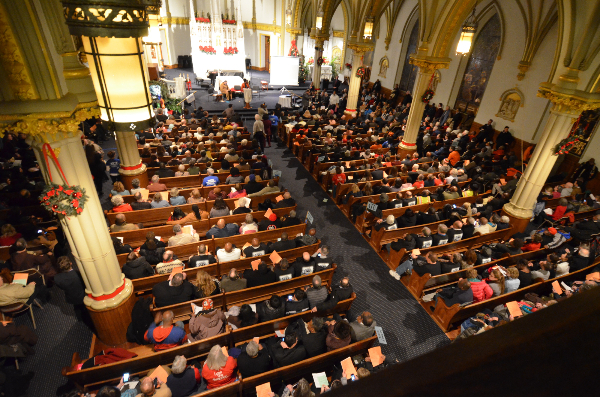 In February with over 1,000 people, GCC presented its recommendations for the consent decree to Cleveland Mayor Frank G Jackson, US Attorney Steve Dettelbach, and a representative from the US Department of Justice. Recommendations included: Constitutional Policing, Internal Accountability, Community Engagement, and Financial Sustainability. 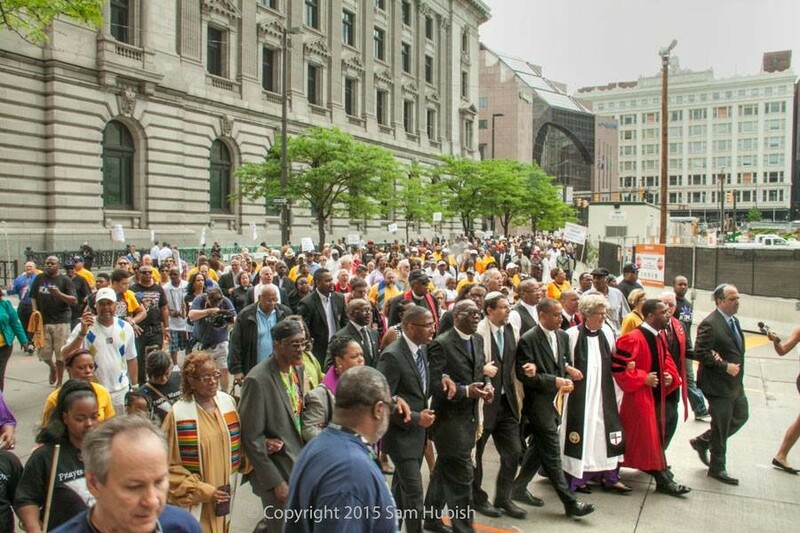 The day after the Consent Decree was finalized (which included most of GCC’s recommendations), over 600 GCC clergy and leaders marched to the Justice Center and City Hall, chanting “We Can’t Wait,” in a call for a long-term, comprehensive plan to transform the criminal justice system in Cuyahoga County. Click for Press. BUILD: BALTIMORE’S UNREST: ORGANIZING FOR CHANGE BY LISTENING & RELATING TO HUNDREDS OF NEIGHBORHOOD RESIDENTS. During the unrest in Baltimore, everyone was talking and no one was listening to the very residents most affected. BUILD acted immediately and launched a campaign to listen to hundreds of residents on their stoops, street corners, and sanctuaries. 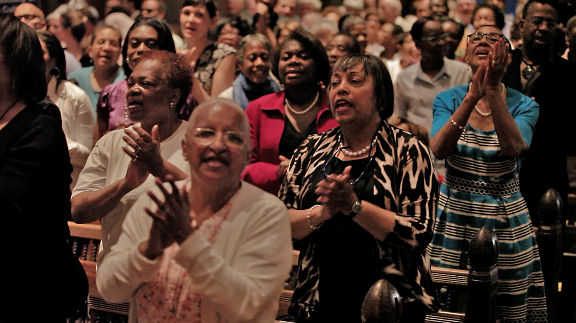 Overwhelmingly, they shared that throughout the unrest they had not been heard. 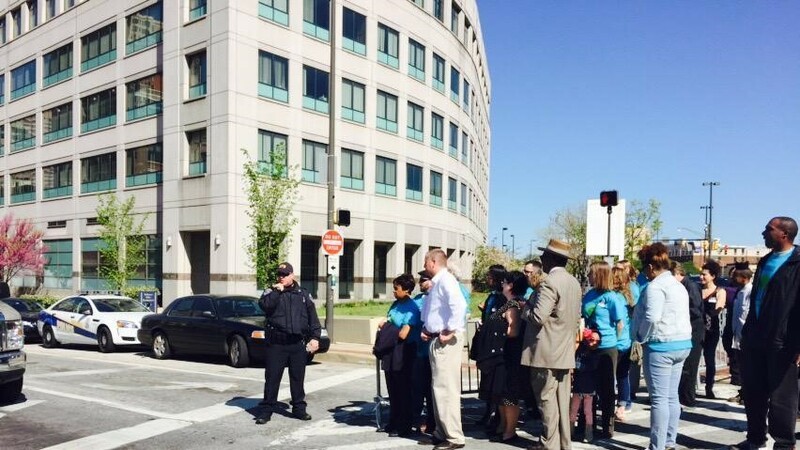 Using the pressure of 150 people in a City Council meeting, followed by an action in front of a roped off City Police Headquarters, BUILD demanded meetings with Baltimore City Council President Bernard C. “Jack” Young and then-Police Commissioner Anthony Batts to meet with residents and listen. They met within two weeks. Through listening, residents began to shape BUILD’s long-term response to Baltimore’s unrest and violence. Read Baltimore Sun Story. BUILD & RESIDENTS DEMAND MAYOR ACT TO RESTORE SAFETY IN BALTIMORE NEIGHBORHOODS: Following the uprising, BUILD worked with and demanded the Baltimore City Police Commissioner Anthony Batts develop an emergency public plan to address the surge in violence (42% increase in murders, shootings almost doubled). Commissioner Batts did not have a plan and he lost the confidence of his officers. BUILD was the first major organization to call for his resignation, and Mayor Stephanie Rawlings-Blake fired Commissioner Batts. BUILD is now working with the interim police commissioner, re-introducing police to neighbors to build trust, calling for foot patrols and other law enforcement resources to stop the violence in Baltimore. See Baltimore Sun Article and ABC2 News Story. CONECT CHALLENGES BRIDGEPORT, CT MAYOR TO IMPROVE POLICE-COMMUNITY RELATIONS. 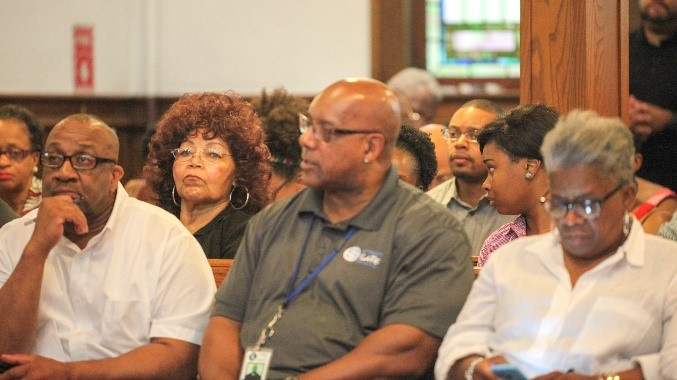 Congregations Organized for a New Connecticut (CONECT) packed Bethel AME Church in Bridgeport with 300 leaders to engage Mayor Finch and Police Chief Gaudett in a public dialogue about the state of the Police Department and police-community relations in Bridgeport, where just a week beforehand 9 people were shot and one killed in a late night shooting spree at a public housing development and where the Police Department is understaffed by 70 officers. Leaders shared stories and pressed for answers about recruitment, staffing, training, department culture, and walking beats. LAKE COUNTY UNITED RESEARCHES LINK BETWEEN MENTAL ILLNESS AND INCARCERATION: Lake County United (LCU) conducted over 56 research actions around the issue of mental health with sheriffs, probation and parole departments, judges, police chiefs, states attorneys, mental health service providers, and hospital staff across Lake County in suburban Chicago. The current focus is to reduce the flow of people with mental illness from the criminal justice system and increase the stock of affordable supportive housing in Lake County. In April, LCU met with all the chiefs of police for Lake County to present the need and urgency for more Critical Intervention Training - the proven and primary way police are prepared for de-escalation tactics in dealing with a person with mental illness. 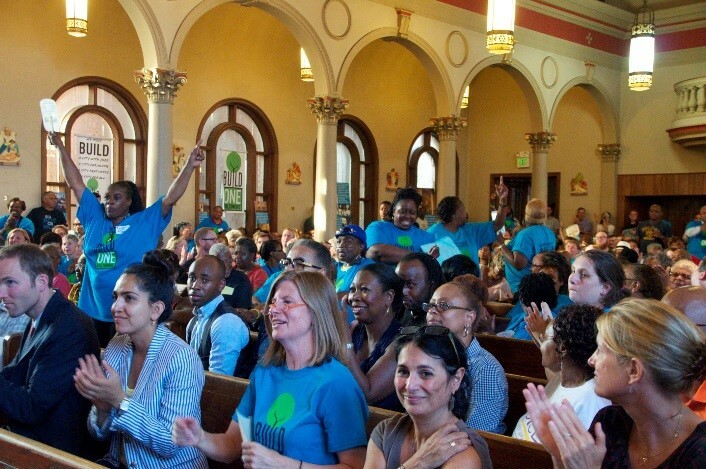 BUILD SECURES JOBS PARTNERSHIP WITH JOHNS HOPKINS: On June 22, 400 BUILD leaders and members filled St. Peter Claver Catholic Church in Sandtown-Winchester, to address the systemic issues underlying the unrest in Baltimore by launching the BUILD One Baltimore Campaign – Making Two Cities One. President Ron Daniels of Johns Hopkins University committed to developing a large-scale employment strategy with BUILD to hire returning citizens and residents living in distressed neighborhoods. BUILD’s jobs movement, Turnaround Tuesday, serves primarily ex-offenders with job readiness training and connections to employment. Read Baltimore Sun and Business Journal articles. WIN DELIVERS JOBS AGREEMENT; NATIONAL MODEL FOR EPA WASTE WATER CLEAN-UPS: Washington Interfaith Network won a Memorandum of Agreement between DC Water, DC Mayor Muriel Bowser and US Environmental Protection Agency (EPA) to invest $90 million for Green Infrastructure and local hiring of DC residents on its massive $2 billion EPA-mandated storm water clean up project. Using a mix of green and gray infrastructure will create 190+ additional jobs. The 51% local DC residents hire agreement affects thousands of jobs annually on all DC Water work--both green, gray and regular maintenance jobs. WIN is working with the Laborers Union to create a national model green infrastructure worker certification program and a centralized worker certification and hiring center, creating opportunities for organizing, wages and benefits, and contractor monitoring. VICTORY OF REGIONAL AND NATIONAL SIGNIFICANCE: DC Water is one of the earliest and most advanced EPA mandated storm water consent decrees. A strong labor- citizen alliance is organizing and winning to make sure that new work is created, the new jobs are living wage jobs, and to make sure the poorest communities in DC, including returning citizens, unlock the opportunities in this emerging industry. If WIN is successful in organizing the DC Water green infrastructure work- it has a path to organizing both the public utility and the private industry green infrastructure work in the region. As one of the first EPA consent decrees with a jobs mandate, DC Mayor Bowser and DC Water GM Hawkinsare strongly promoting the jobs agreement as a national model; the DC work – if we continue to organize and win- will have national impact on this new industry. Path Co-Chair Rev. 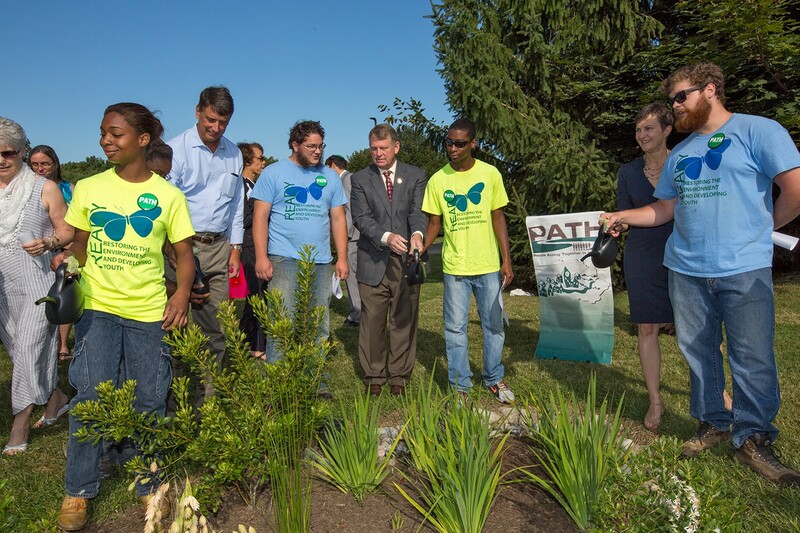 Paige Getty, County Executive Allan Kittleman, and State Senator Guy Guzzone water the rain garden at Beth Shalom Congregation with Crew Members from the READY Program. PATH LEADS ON ENVIRONMENTAL JOBS FOR YOUTH TO CLEAN UP CHESAPEAKE BAY: People Acting Together In Howard (PATH) won over $500,000 to fund and to expand the Restoring the Environment and Developing Youth (READY) program to hire for 45 full-time summer positions and a year-round crew of six young adults. This remediation is mandated by the US Environmental Protection Agency (EPA) to address pollution to the Chesapeake Bay. Over the last three years, PATH through READY has secured over $2 Million in storm water infrastructure funding to create 166 full-time summer job positions for young adults and to address over 30 acres of storm-water runoff. PATH's ongoing actions and accountability to create the READY youth conservation corps is giving students job experience and helping to train a new generation of environmental leaders. 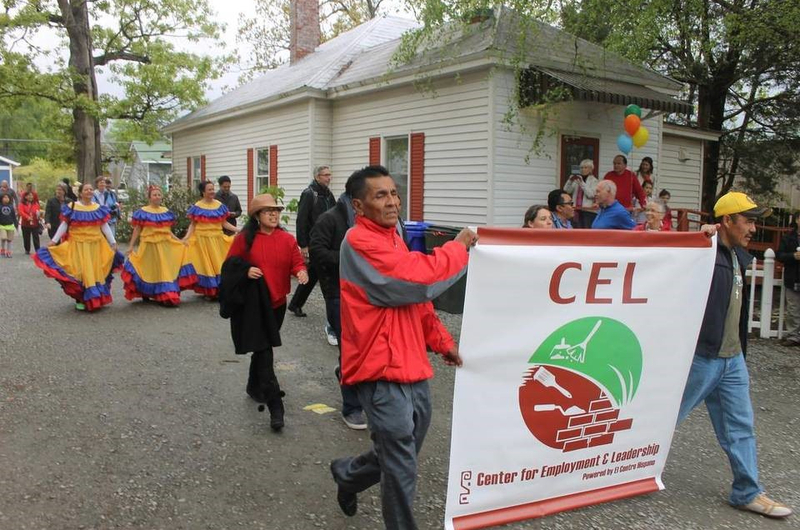 Orange County (NC) Justice United Celebrated the Opening of the Center for Employment and Leadership, a new workers’ center for day laborers in Carrboro, NC who previously sought employment on a street corner at the edge of town. The opening marked the conclusion of Justice United's Fair Jobs and Wages Campaign, which won the funding and political will from the Town of Carrboro to assist (JU member institution) El Centro Hispano in building and staffing the center. Along with providing a safe and dignified space to seek work, the Center will also serve as an important base for laborers to organize against rampant wage theft in the area. In May,147 day laborers sought jobs at the Center, a number that is anticipated to increase as domestic workers also begin to use the facility. Read Chapel Hill-Carrboro News article. 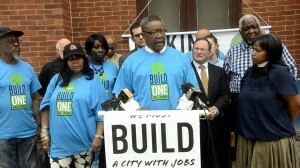 Common Ground Demands Hedge Fund-Milwaukee Bucks Owner Fix Foreclosed Properties. In January, over 100 Common Ground leaders, students, and neighbors braved the cold and held a press conference in front of a crumbling duplex on North 44th St. No one is paying taxes on the vacant building, and it has 23 code violations. It is only one of 300 foreclosed properties controlled by Nationstar Mortgage. Wesley Edens owns the majority of the stock and is Chairman of the Board of Nationstar Mortgage Company. According to a plan Wisconsin Governor Walker announced, Edens will receive $220 million in Wisconsin taxpayer dollars to help him build an arena for another of his properties, the Milwaukee Bucks. During the spring and summer, Common Ground fought hard to prevent a taxpayer subsidy for a new arena without a significant investment in neighborhoods. 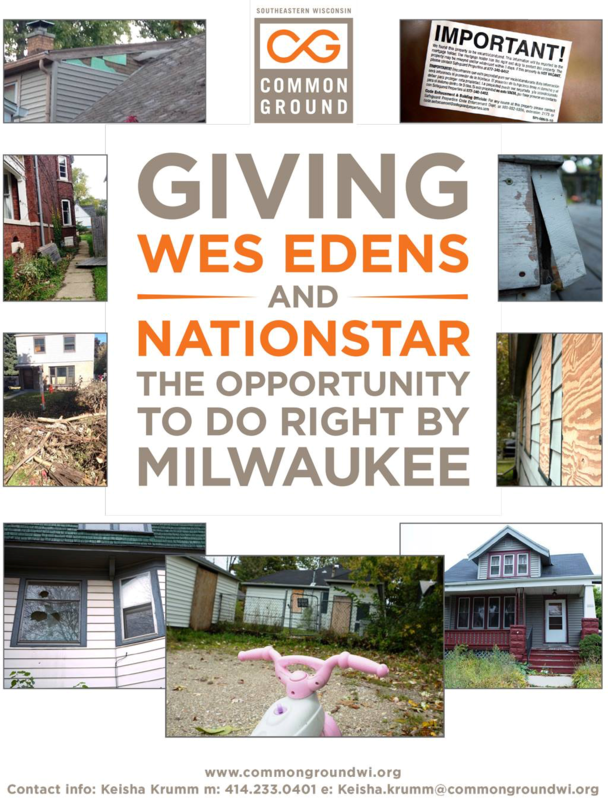 Common Ground leaders supported by IAF-sister organization Dallas Area Interfaith, went to the Nationstar Annual Shareholders Meeting to demand Edens meet with Common Ground to talk about his crumbling properties and how they are undermining the city of Milwaukee. As a result, Nationstar CEO Jay Bray agreed to meet with Common Ground leaders to address the blighted properties. Washington Interfaith Network (WIN) leaders break ground on 140-unit tenant led affordable housing project in the Brightwood neighborhood with DC Mayor Muriel Bowser. WIN Helps Secure $150 Million for Affordable Housing in DC, including $100 million for the Housing Production Trust Fund; $40 million for the building of more humane, smaller family shelters in DC to close the dilapidated DC General shelter and a 35% increase in funding for homeless services--all in the FY 2016 budget. WIN also started construction on new affordable housing: 140-unit Brightwood tenant purchase and renovation and Eastbrooke Apartments, 39 affordable family rental units. Washington Interfaith Network (WIN) also celebrated groundbreaking on North Capitol Commons, 124 units of affordable housing with 60 units of Permanent Supportive Housing for formerly homeless veterans where WIN organized to deliver the land and crucial subsidies for the project. 150 VOICE in Northern Virginia leaders and Senator Mark Warner listen as Georgetown South homeowners tell about the resurrection of their community after the foreclosure crisis. 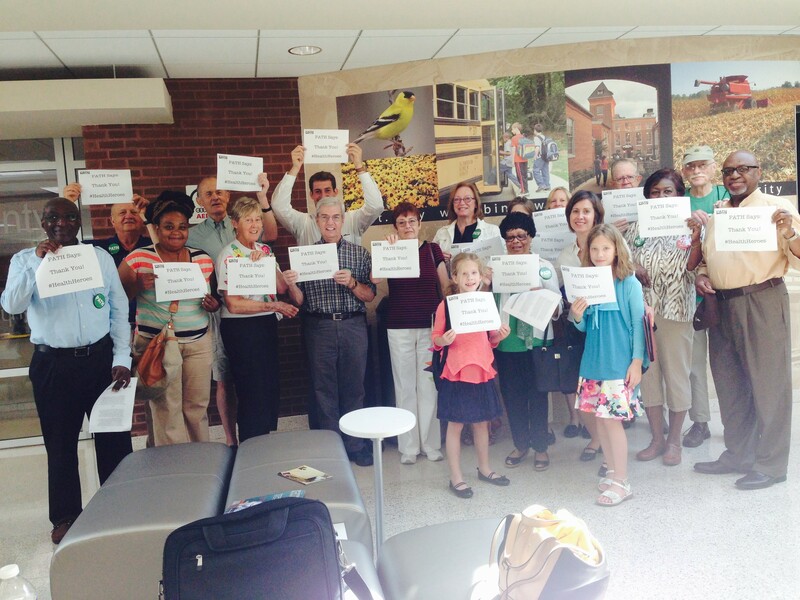 VOICE in Northern Virginia Celebrates Major Victories in VA Bank and Foreclosure Accountability Campaign: On May 31, 2015, 150 VOICE in N. VA leaders gathered with Senator Mark Warner and other officials to 1) celebrate 3 years of VOICE’s organizing that secured 1,000+ loan modifications, $250+ million in principal reduction, and $1 million for housing counseling, that helped many Prince William families stay in their homes in response to the predatory loan and resulting foreclosure crisis; 2) announce securing $3.5 million for the Metro IAF/VOICE Equity Restoration Fund ($1.5 million from Bank of America; $1 million from JP Morgan; and $1 million from GE), which will help leverage $7-$10 million from religious and other social investors for the Fund that will finance 100-150 homeownership and 1,000 affordable rental housing units over the next 15 years for Prince William & NOVA families; and 3) bless a renovated Georgetown South house that was once abandoned due to foreclosure. Prince William County had 27,000 foreclosures, the most in Virginia. Hundreds of NYC Public Housing residents and Metro IAF Leaders challenge DeBlasio administration officials to repair their mold-infested apartments. AIM wins $44 million for Affordable housing in Montgomery County, MD: Action In Montgomery (AIM) and partners in the Montgomery Housing Alliance protected funding for affordable housing in the county's budget, winning $44 million for housing amid widespread budget reductions in other areas of the county. This housing allocation will produce and preserve over 600 housing units for the county's most vulnerable residents in the next year. Since organizing 10 years ago to win the first dedicated fund in Metro DC, AIM has secured $494 million for the Affordable Housing Initiatives Fund, producing/preserving 7,265 affordable housing units. 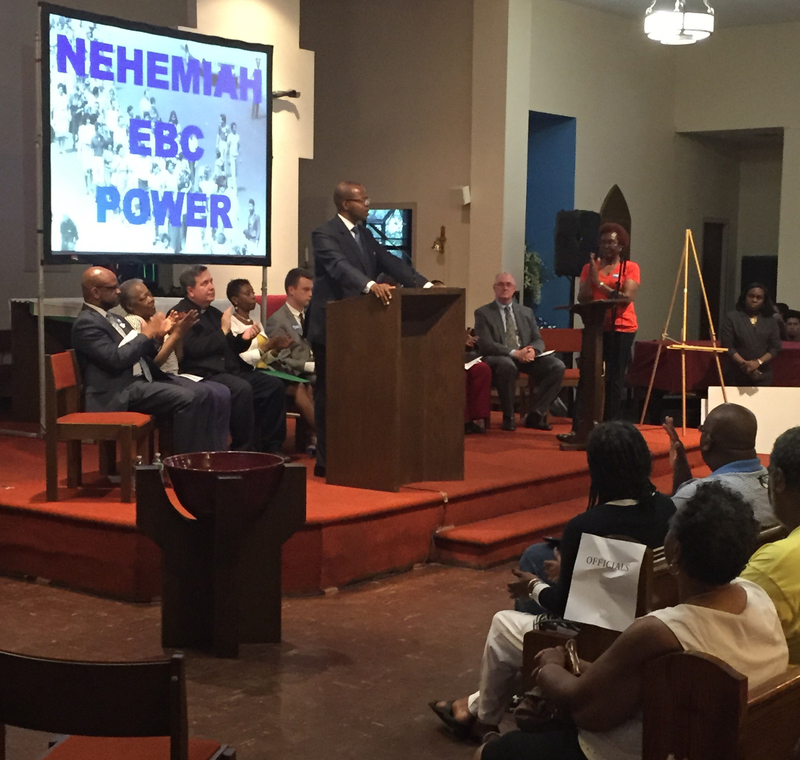 EBC Nehemiah Homeowners Launch Organizing Drive: On June 29, East Brooklyn Congregations (EBC) organized 500 homeowners for an assembly to re-found the Nehemiah Homeowners Association. 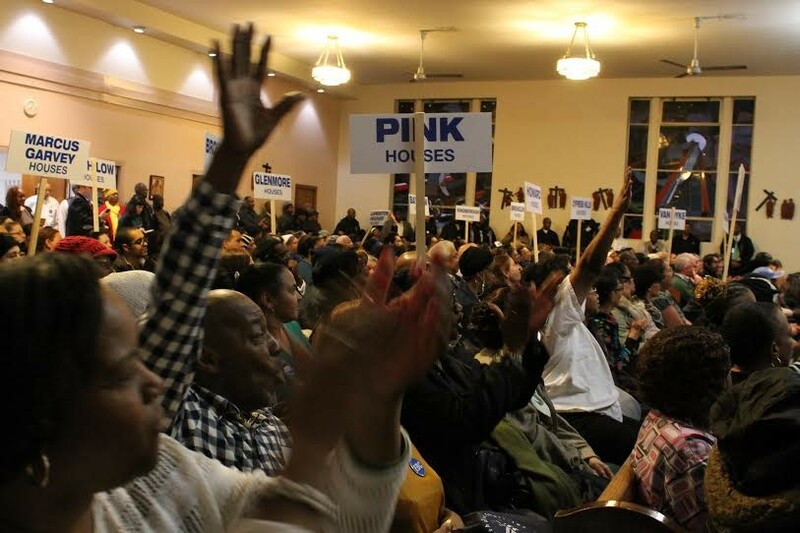 EBC’s reorganizing campaign included dozens of housing meetings and nearly 30 block inspections. Homeowners committed to focus on organizing money through paying their dues, and won commitments from city agencies to make important improvements to their neighborhoods, including removing overgrown trees, repairing cracked sidewalks, fixing bad lighting, and requiring police to relate to residents through face-to-face meetings. Over the last 30 years, EBC has built more than 3,500 Nehemiah homes for first time owners, transforming once blighted East New York into a vibrant community. METRO IAF CHICAGO WINS SUPPORTIVE HOUSING & IMPROVEMENTS FOR TENANTS: In July, with pressure from Lake County United, the Mundelein Village Council voted to support the construction of a 40 unit affordable and supportive housing development, including 12 apartments that will be devoted to people with physical and mental disabilities. Construction will begin in mid August. 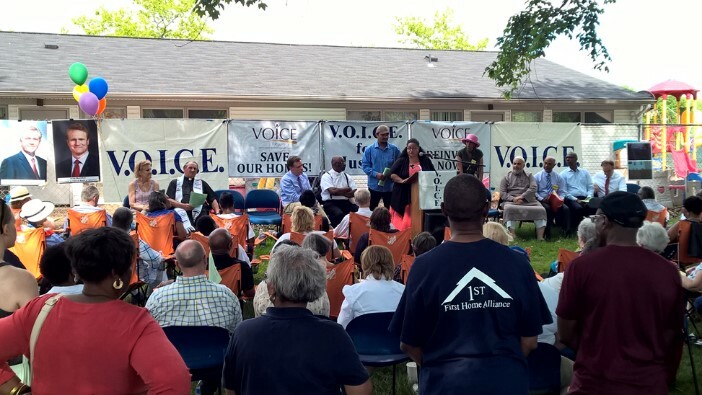 On May 17th, 20 DuPage United leaders from mosques, churches and synagogues walked door to door in Willowbrook, IL at an isolated apartment complex of over 1500 residents in Chicago’s western suburbs and met their neighbors living in low-income housing. DuPage United leaders knocked on over 330 doors, had over 120 conversations and identified key concerns such as access to healthy food, transportation and strained relationships with local police. After building a strong relationship with a property owner supportive of resident concerns, Villagebrook Apartment resident leaders successfully documented the discriminatory practices of the apartment manager which resulted in her termination and a establishment of new “house rules,” and new parking arrangements that prevented residents from having family and friends over or supporting loved ones in a crisis, regular meetings with the new property manager and the established parent council. BUILD Forces Baltimore Mayor to Keep Her Promise; Wins $4.2 million for After-School: After 5 years of organizing, BUILD, Baltimoreans United in Leadership Development and Child First won doubling after-school funding in Baltimore to increase youth opportunities. 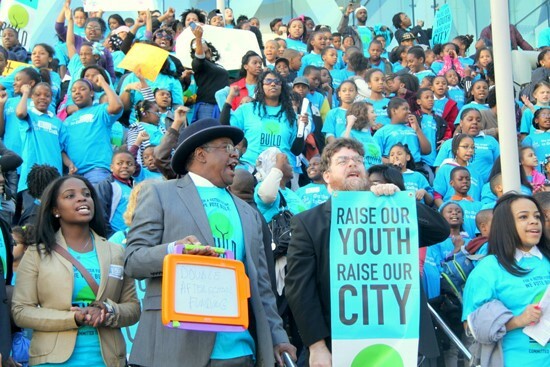 In the aftermath of the unrest in Baltimore, Child First and BUILD met numerous times with 10 City Council representatives to galvanize support. City Council Representatives committed to 150 Child First parents and children they would make increasing after school a top priority in budget negotiations and call for the Mayor to keep her commitment. 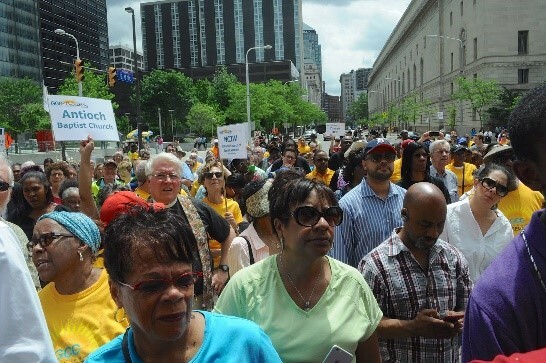 On May 22nd, Child First turned out over thousand parents and students to hold the City Council accountable, and on June 8, Mayor Stephanie Rawlings Blake increased after school funding by $4.2 million. Read Baltimore Sun Stories: June 7th & May 11th. 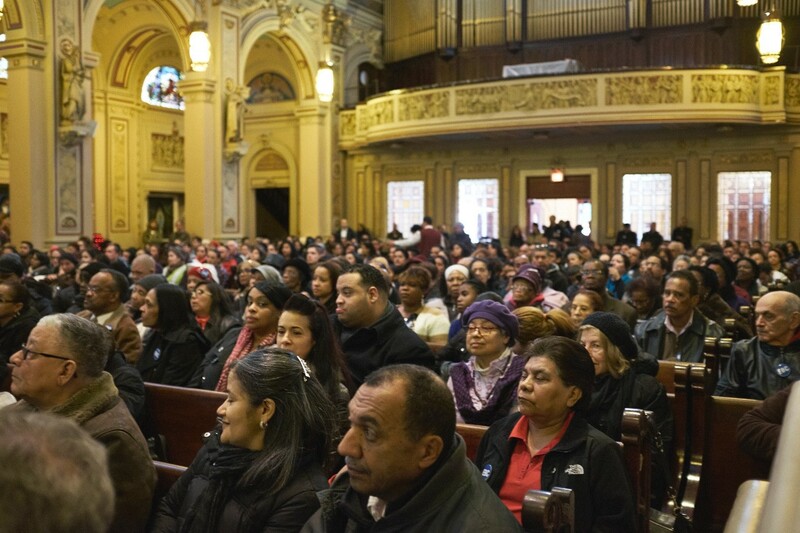 MANHATTAN TOGETHER (MT) & SOUTH BRONX CHURCHES (SBC) ORGANIZES 900 PARENTS TO MEET WITH NEW YORK CITY SCHOOLS CHANCELLOR. In May, over 900 Metro IAF leaders pushed New York City Schools Chancellor Carmen Fariña to commit to a plan to resolve challenges students with special education and mental health needs face getting the necessary diagnosis, and receiving needed services. 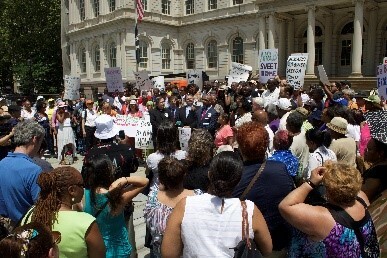 At two large Education Actions that Metro IAF organized, in partnership with the New York Daily News, the NYC Schools Chancellor committed to take action—See NY Daily News. 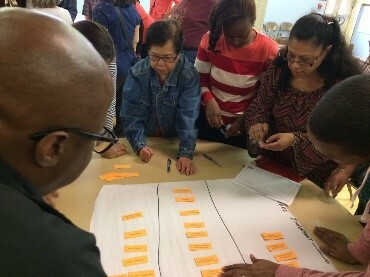 After 1,200 face-to-face meetings by MT and SBC leaders and staff, a team of educators, family members and other concerned community leaders came together to make improvements on important educational issues in New York City. This team is now organizing to hold the Chancellor accountable to the commitments she made to improve the quality of education throughout the City when the new school year starts. CONECT WINS BETTER TREATMENT FOR CHILDREN IN CONNECTICUT: Alarmed by studies documenting the use of restraint and seclusion more than 30,000 times in CT schools, disproportionately with autistic and minority children, Congregations Organized for a New Connecticut’s (CONECT) Education Team began investigating and taking action on this issue. Working with the state's Child Advocate, CONECT leaders pushed for Senate Bill 927, which limits the use of these tactics, requires training of teachers and administrators, and mandates parental notification within 24 hours. The bill passed in late May and was signed into law by Gov. Malloy on June 23rd. AIM LAUNCHES PARENT ORGANIZING AND AFTER-SCHOOL STRATEGY IN SUBURBAN MARYLAND: Action in Montgomery is quickly becoming a leader in organizing public schools in the suburbs. This Spring, AIM won funding to help kick-start Child First Montgomery, an innovative after-school and parent organizing initiative modeled off of the highly-successful Child First Authority created by BUILD, AIM's sister organization in Baltimore. 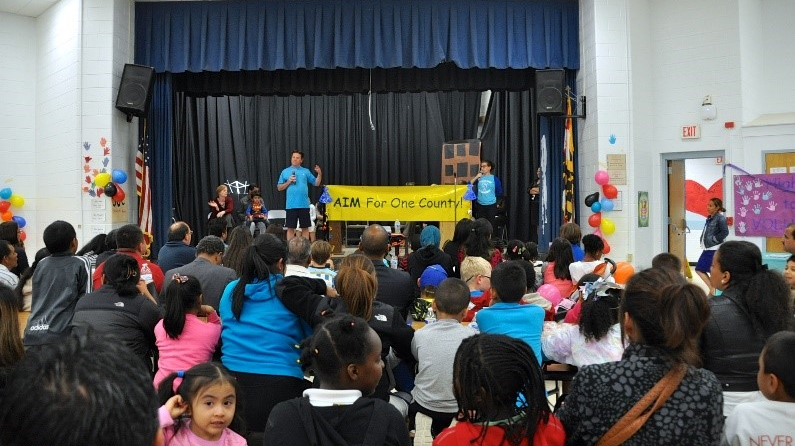 AIM conducted a week-long pilot after-school program for 215 students at two large elementary schools in Montgomery County and turned out 450 parents and educators at the end-of-program action in May. Rev. Dr. Keith Savage, VOICE Leader, addresses Prince William County, VA School Board before inviting 100 VOICE Leaders to stand in solidarity to expand Pre-K.
VOICE PUSHES PRINCE WILLIAM COUNTY, VA TO EXPAND PRE-K FOR LOW INCOME CHILDREN. VOICE in N. VA organized parent and community leaders to push the Prince William County Board of Education to approve unanimously accepting a $10 million Federal grant to expand Pre-K to an additional 600 low-income children, an action that the Board was going to reject before VOICE’s organizing. Prior to VOICE’s organizing, the School Board was going to refuse to accept this grant. Now, the Pre-K expansion of 8 new preschool classrooms in the fall of 2015 will serve an additional 144 low-income children per year for a total of 576 additional children over the next four years. 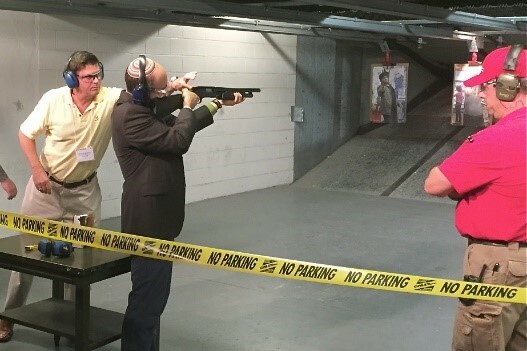 METRO IAF & WESTCHESTER UNITED HOST NATION’S FIRST SMART GUN SHOW. In May, Westchester United hosted, along with the Do Not Stand Idly By Campaign, the nation's first ever "Smart Gun - Gun Show" in New Rochelle, NY. Present at this event were 80 Metro IAF leaders from five states, nine police departments from New York, New Jersey and Connecticut, and five different gun safety entrepreneurs with designs for various prototypes of personalized guns (aka smart guns) that would potentially halve the number of gun deaths in America. WHAT IS METRO IAF’S DO NOT STAND IDLY BY CAMPAIGN? Do Not Stand Idly By (DNSIB), Metro IAF’s campaign to persuade gun manufacturers to make and distribute guns more safely and responsibly, takes a unique approach: we seek to build an “NRA for the public sector” – an organized group of public-sector gun buyers who can use market power to leverage change. 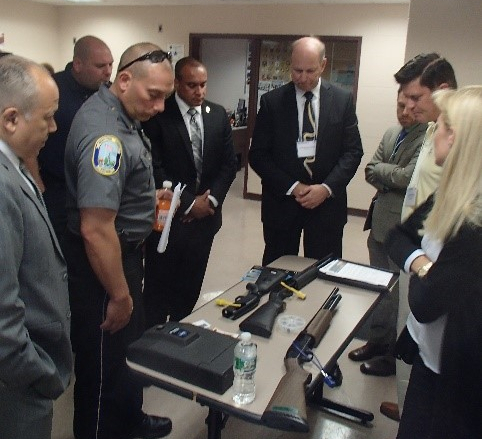 We are gathering steam: In May, at the New Rochelle (NY) Police Department, DNSIB held the world’s first smart gun show. 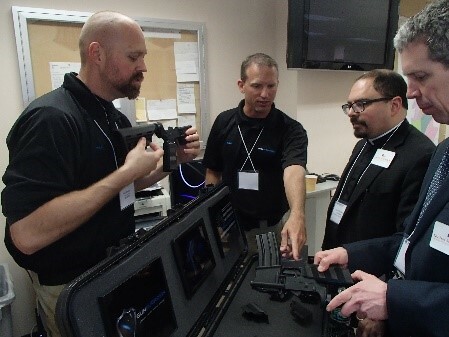 Leaders and officers from nine police departments in New York, Connecticut and New Jersey attended, and were able to see and shoot smart guns and smart locks from five leading companies in the field. More gun buyers – and officials who shape public gun purchasing decisions – are signing on. In April, more than 350 religious leaders wrote to the President asking him to honor the promise he made in Newtown to use “whatever power this office holds” to reduce gun violence. Metro IAF held several meetings with White House staff during this period. The end result: “You are on our radar.” Action from President Obama and his administration in this area will be a top priority in the months ahead. Metro IAF published an NY Times Op-Ed this summer. See DNSIB press coverage: NY Times, Daily News, The Guardian, The Trace, and the Brian Lehrer TV show. 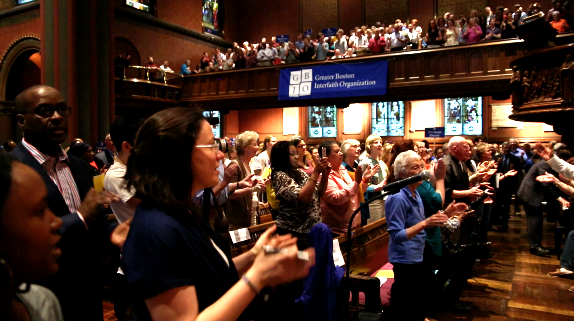 GBIO SECURES COMMITMENTS ON GUN VIOLENCE & SENTENCING REFORM FROM TOP MA LEADERS: 1,650 Greater Boston Interfaith Organization (GBIO) delegates, as well as many powerful public leaders, attended GBIO’s May 12, 2015 Rededication Assembly & Action., with the following results: The Governor committed (1) to take seriously implementation of the GBIO-fought-for gun violence prevention law, including linking the Massachusetts and federal background check databases and (2) to participate in Metro IAF-sponsored “safe gun” fairs. The MA Speaker committed to making criminal justice reform a priority in this session of the legislature (bail reform, eliminating mandatory sentences for drug offenses, & eliminating barriers to former offenders obtaining drivers’ licenses). Read Boston Globe Story. 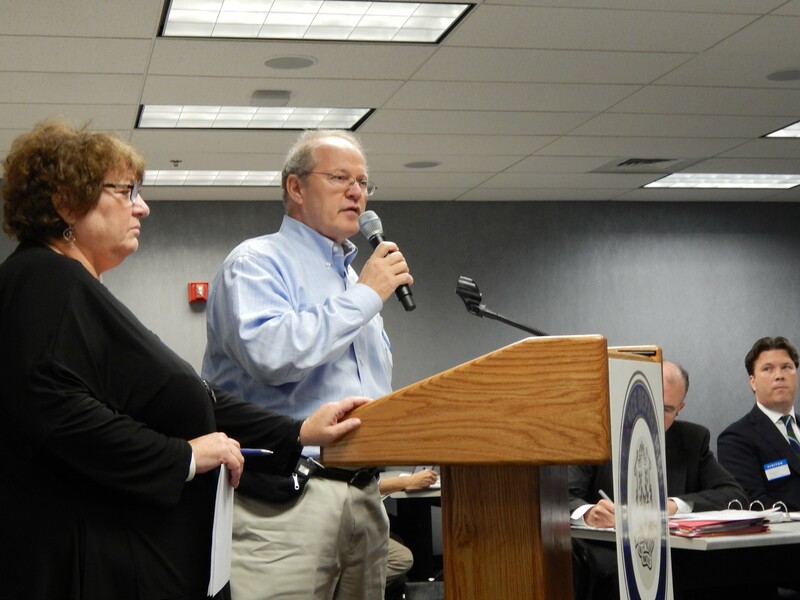 Sandy & Arlene Block, CONECT leaders from Temple Israel in Westport, CT, testify before a rate hearing on Anthem Blue Cross Blue Shield's 2015 rates. Anthem's rates were reduced by $66 million in the ruling subsequent to the hearing. CONECT WINS PUBLIC RATE REVIEWS ON HEALTH CARE PREMIUMS: After winning a $66 million savings for Anthem Blue Cross Blue Shield customers due to a public rate hearing, Congregations Organized for a New Connecticut’s (CONECT) Healthcare Team pushed for legislation making public rate review hearings a permanent part of the process. After the bill passed out of the Insurance Committee with strong bipartisan support, the new Insurance Commissioner agreed to an updated agreement with the state's Healthcare Advocate, allowing public hearings on rate increase requests of 10% or greater -- an improvement over the previous agreement CONECT helped forge which had a threshold of 15%. The first hearings under the new agreement are scheduled for late summer. PATH leaders helped pass a bill that ensures healthy options are offered in all vending machines on county property. Above, PATH leaders thank the County Council for their support in overriding the County Executive's veto to that bill. PATH WINS HEALTHY FOOD IN SCHOOLS. People Acting Together in Howard (PATH) has fought for and won substantial changes to the Howard County, MD Schools' Wellness Policy, moving it from being ranked in the bottom third in the nation to Number 3 in the U.S. overall! This policy provides universal breakfast, more recess and active time for students, and requires food served in schools to be healthy. It has a particularly large impact on the low-income students who receive free and reduced meals, and will help protect against the epidemic of chronic illnesses including diabetes and high blood pressure that the youngest generation is facing. This youngest generation is the first to have a shorter projected life expectancy than their parents, because of these illnesses. VOICE holds house meetings before DAPA information session at Holy Family RC in Dale City, VA to listen to immigrants about their concerns. VOICE HOLDS DAPA TRAININGS FOR 200 N. VIRGINIA IMMIGRANTS. President Obama took Executive Action in November 2014 by announcing Administrative Relief, otherwise known as DAPA/DACA that would provide legal status to an estimated 4 million undocumented immigrants. Since people were confused and unsure about the court injunction that blocked implementation of the new program, VOICE leaders knew it was the time to act. People would be vulnerable to fraud, but they would also be vulnerable to being anonymous. By connecting with our institutions, immigrants are not alone. 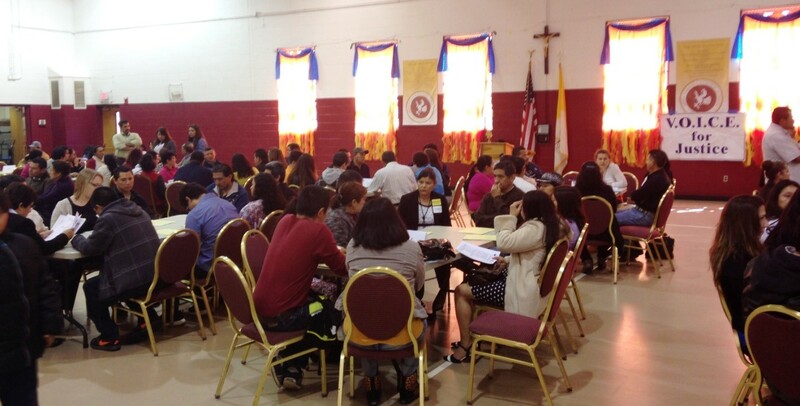 VOICE in N. Virginia organized two Immigration Information Sessions in Dale City and Reston, VA attended by 200+ undocumented immigrants eager to apply for Deferred Action status under President Obama’s Administrative Relief. Prior to the information sessions, VOICE trained over 25 bilingual leaders, who conducted 20 house meetings before information was presented at the two events. EBC DEMANDS NYC PARK COMMISSIONER RENOVATE PARKS FASTER: In 2014, East Brooklyn Congregations (EBC) won nearly $5 million to renovate two playgrounds in Bushwick, but construction was slated to take far longer than leaders wanted. 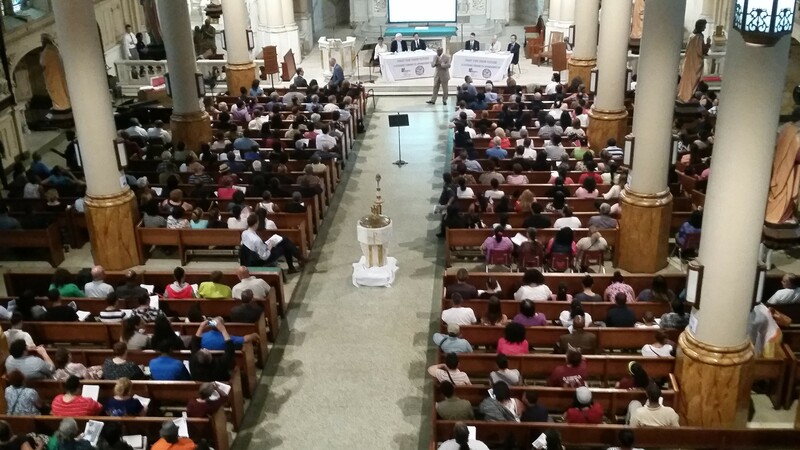 On March 22, 2015 over 600 EBC leaders gathered for an assembly at Saint Barbara's Roman Catholic Church in Bushwick. We called upon the Parks Commissioner to reform the process for making capital improvements to parks, and recognized New York City Comptroller Scott Stringer for signing on to our Don't Stand Idly By campaign. In response the Parks Commissioner pledged to have the projects completed within two and a half years, and broke ground the very next week. See New York Times Article. UNITED POWER PUBLISHES OP-ED CHALLENGING CHICAGO MAYORAL CANDIDATES: United Power for Action and Justice (United Power) published an op-ed in The Chicago Tribune ahead of the Mayoral run-off election, outlining 4 Big Ideas to address Chicago’s future. The op-ed laid out United Power’s four-point agenda on housing, jobs, gun violence, and criminal justice and was distributed throughout its member congregations leading up to the election. See Chicago Tribune Op-Ed. 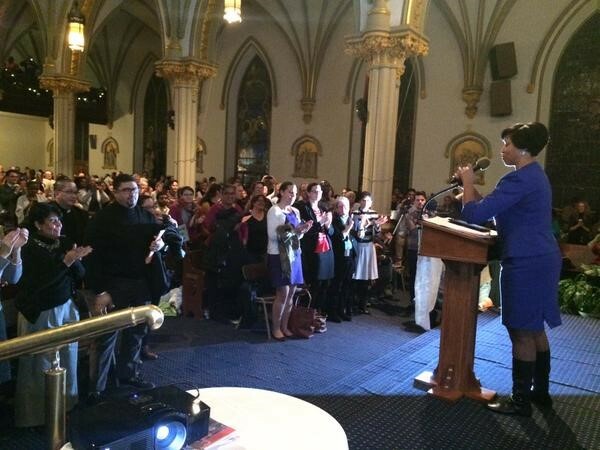 900 WIN LEADERS INAUGURATE NEW DC MAYOR; DEMAND ACTION ON LIVING WAGES AND JOBS: Washington interfaith Network held a 900+ person City-Wide Inaugural Action with new DC Mayor Muriel Bowser during her first week in office. Mayor Bowser committed to allocate $100 million to affordable housing in her first budget, require DC Water and other agencies train and hire hard to employ DC residents, address working conditions and wage issues in DC Metro’s Para Transit service, as well as take action on constituent services issues identified by WIN in Ward 7 (i.e. removing abandoned cars, repaving roads, etc.) and in other DC neighborhoods. NJ TOGETHER MOVES CLOSER TO LAUNCH OF JERSEY CITY ORGANIZATION: In Jersey City, where a sponsoring committee of more than 30 congregations has been hard at work, more than 200 leaders have participated in trainings in 2015. Over two months, these leaders conducted a listening campaign that engaged 2,900+ people about what they most want to change as well as their vision for the future of Jersey City. NJ Together projects a Spring 2016 launch for the new organization in Jersey City. DURHAM CAN GOES PUBLIC WITH NEW ACTION AGENDA: Durham Congregations and Neighborhoods (Durham CAN) held a June Public Action, with 500 Durham CAN leaders and announced a new collective agenda for social change rooted in a listening session campaign that involved input from more than 1,500 Durham residents and celebrated victory on living wage agreements for thousands of transit related jobs and advanced further commitments from City authorities on a job training program, which will connect Durham residents with those jobs. At the Action, Durham CAN had major tension with the Durham Police Chief, who refused to make a public commitment to adopt further police accountability reforms to enhance nationally recognized limits Durham CAN helped win in 2014 to curb police profiling. See Press: ABC11; WRAL; News & Observer. 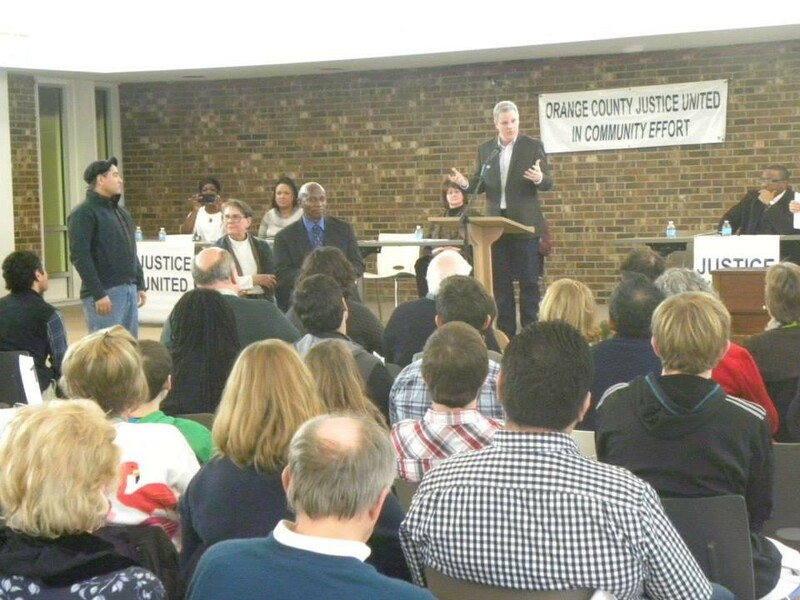 ORANGE COUNTY JUSTICE UNITED (NC) CELEBRATES VICTORIES IN AFFORDABLE HOUSING, TENANT ORGANIZING, AND JOBS: Over 160 community leaders from northern and southern Orange County attended the Justice United Assembly on March 1 to preserve, build, and strengthen affordable communities. They celebrated: tenant rights campaigns that resolved health, safety, and management issues in two low income housing developments, Gateway Village (Hillsborough) and the Landings (Carrboro); the opening of a Workers Center in Carrboro for day laborers, and the winning of $689,000 in local funding (annually) for preserving and developing affordable housing in Chapel Hill. Support Organizer Training: Invest in the training and development of Metro IAF organizers by making a one-time gift (or recurring deposit) to organizer Recruitment & Development. Copyright © 2015 Metro IAF, All rights reserved. Reporting on what was learned, speakers told stories of families unable to afford outrageous mortgage payments, of barriers to educational opportunities, and of a series of speciﬁc concerns surrounding safety and mobility – for seniors and others. The next steps for this new organization is to do in depth research about the dynamics surrounding these struggles so as to prepare for effective and meaningful responses. Anne Arundel Connecting Together (ACT) united, in search of solutions, going beyond the politics of division. 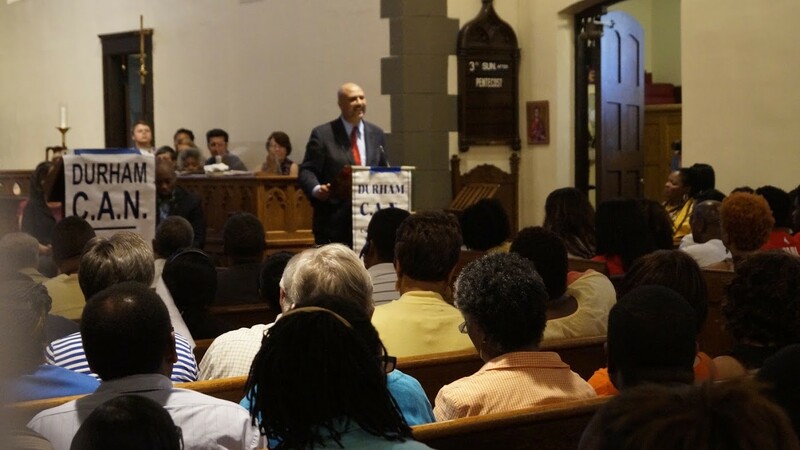 More than 600 people packed the sanctuary of Silver Spring UMC to launch Action in Montgomery’s 2017 Listening Campaign and to stake a claim on the future of Montgomery County. Leaders celebrated AIM’s recent victories and called on county officials to ensure that Montgomery County residents are welcomed and treated fairly, regardless of faith or immigration status, and to partner with AIM and the community to expand affordable housing, quality and affordable afterschool care, and to work for a just transit system for workers and riders. Churchgoing Christians are used to hearing their ministers quote from Matthew 25:35: For I was hungry and you gave me something to eat. I was thirsty and you gave me something to drink. I was a stranger and you invited me in.